In celebration of our vintage themed November meeting, our block lotto this month is a modern take on something that is most definitely vintage – POLAROID PHOTOS! These blocks are made up of solid white and a modern novelty print. They’re the perfect opportunity to practice fussy cutting, so let’s chat about that for a minute before we get into the block instructions. 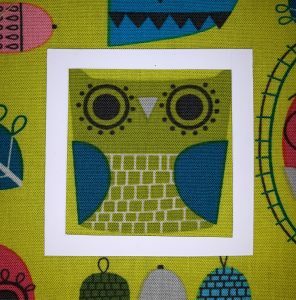 Fussy Cutting is when you cut out a specific portion of fabric in a way that showcases the print, rather than just cutting a piece off the edge. In this situation, we’re looking for prints that will be showcased within the polaroid “frame”, so think of the images as photos. 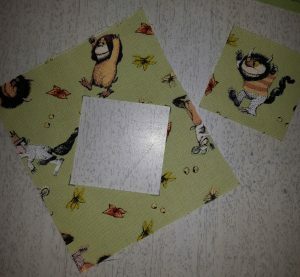 When you’re fussy cutting, having a template makes life a lot easier! 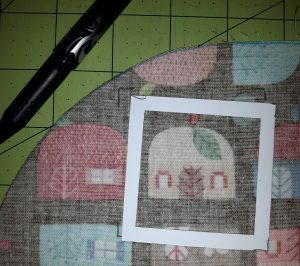 It’s easy to make one out of cardboard or cardstock – just cut a piece the size of the fabric piece you need (in this case 2.5″), and then cut out the centre, leaving a 1/4″ “frame” around the edge. The finished size of the printed fabric in this block will be 2″, so that’s the size of the hole in the centre that I cut out. 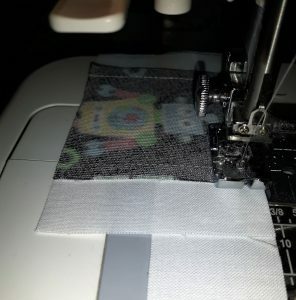 The template helps you to determine if a print will work, before you actually cut the fabric. Remember back when we took polaroids? They weren’t cheap, so you didn’t want to “waste” one by taking a photo that was off centre, or that didn’t have a real purpose. Think of the template as your focus frame, like in a camera. or when the print is so small that it’s lost. 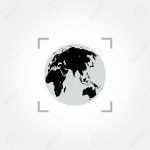 The template will also help you find ways to work around a print that’s a bit too large – in this case, you can cut only a portion of the image, to make it look like the figure is peeking into the “photo”. Some people don’t like to fussy cut because it wastes fabric – which it does! But it also allows you to showcase the fabric print, which is a pretty good trade off in some situations. 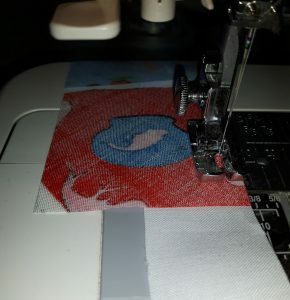 Once you position the template in the perfect spot, use a fabric pen to mark the corners of it (on the front of the fabric, or if it’s too dark, on the back). That will let you use a ruler and a rotary cutter to cut out the portion you need. 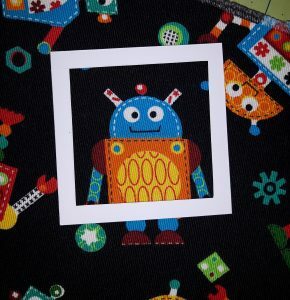 Now that you’ve got your novelty prints cut, you’re ready to sew. The blocks themselves are very quick to make, around 5 minutes each when you do them assembly line. Prep your novelty squares by making sure that the images are all facing the same direction – none are upside down! 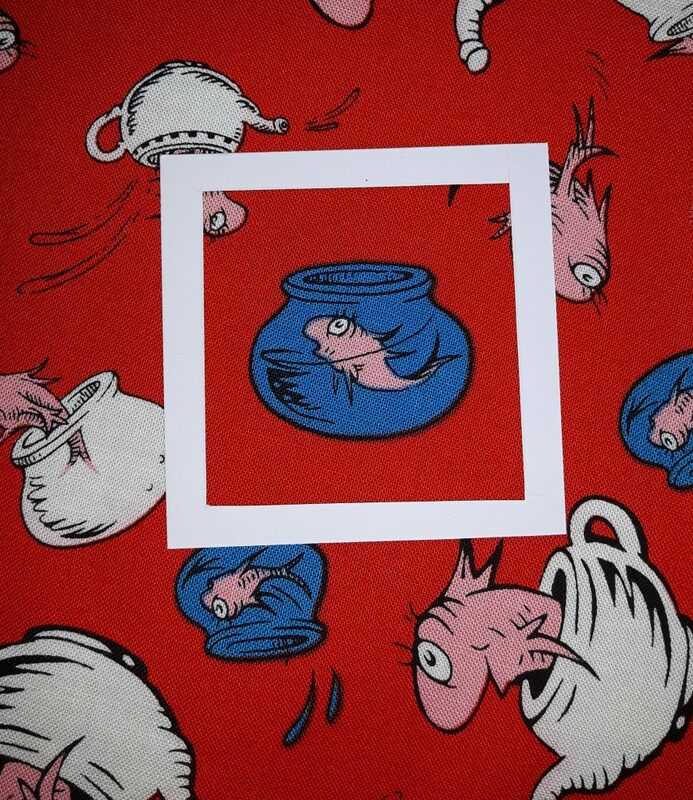 You’ll need a 2.5″ square piece of the modern novelty print, and strips of white solid fabric in two widths, 1.25″ and 1.75″. 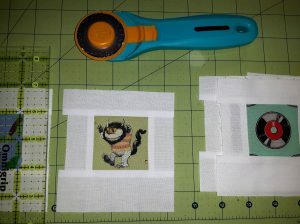 Sew one of the 1.25″ wide strips onto the SIDE of your novelty print. 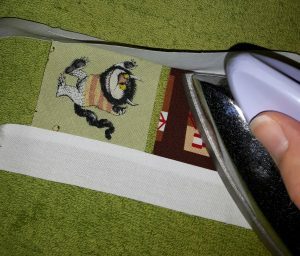 It works best if you put the strip underneath the print, because fussy cut fabrics often end up being cut on the bias. By putting the on-grain strip on the bottom, you’ll prevent the novelty print fabric from stretching. 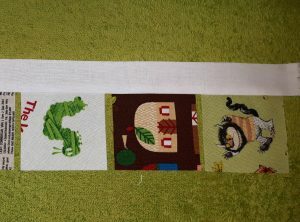 If you’re sewing multiple blocks at the same time, leave a little space between the novelty squares, just keep sewing! 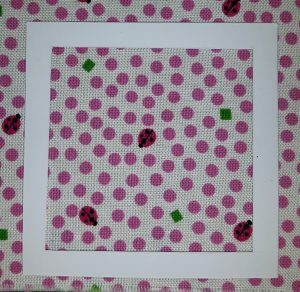 Press the white borders to the side – always press into the white for this block. 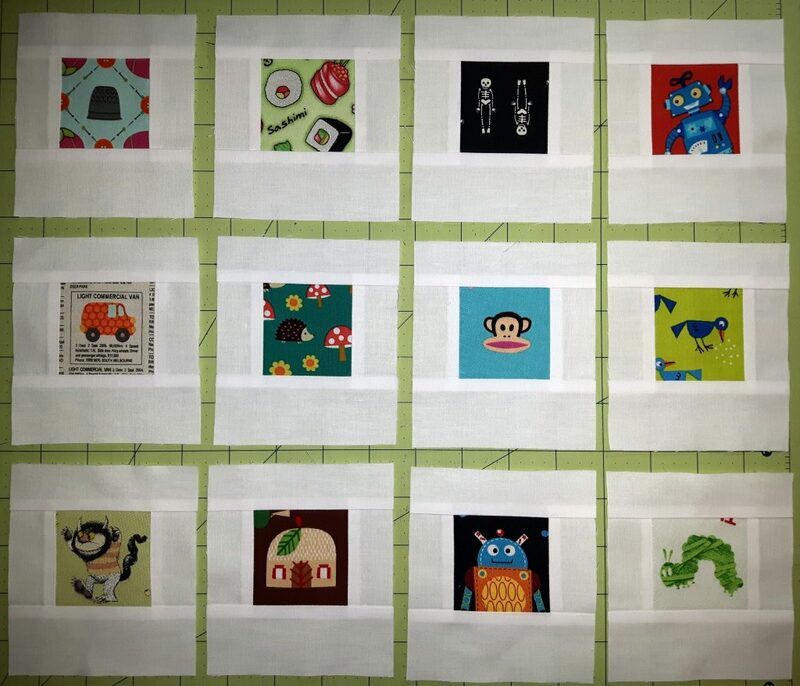 Sew another 1.25″ strip onto the other SIDE of the novelty print squares. Don’t worry about cutting the pieces apart, if you’re doing multiple blocks at once. Press this strip to the white side as well. If you’re finding that your iron is warping the white borders, you’re probably ironing rather than pressing – I have that problem too! 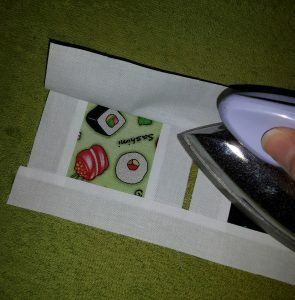 It helps to use the side if your iron to press the border down, rather than the tip. NOW you can cut the pieces apart! Don’t worry to much about the sides of the pieces being perfect, just trim the top and bottom to be even. 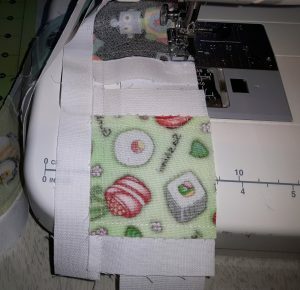 Sew another 1.25″ strip along the TOP of your novelty print. Again, put the solid white strip underneath the novelty square to reduce stretching. Press the top strip to the side again. 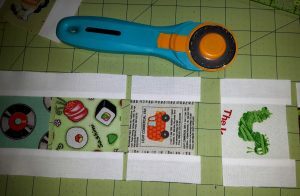 Sew the 1.75″ strip to the BOTTOM of your pieced block. Press your last piece to the side, nice and neat! Trim your blocks! Don’t worry too much about them being a specific size, just trim them to that the edges are neat – whoever wins will be trimming them to their preferred size. You’re done! Go make more! Every block you make is a chance to win more at the November meeting! What a great tutorial – your instructions are so clear! Thanks! Always a treat to read an amy tutorial! Thanks for the detailed tips! Great tute! Now time to dig around the stash :). Amy – your instructions are always so clear and encouraging. This is going to be fun and I’ll even take a ticket this time! Great instructions Amy! I made a little view finder and it was genius … I made 20 blocks last night!